Having a velodrome so far away from home (26 miles door-to-door), it became obvious that having a frame ready set-up for racing was essential. I could dash back from work, jump on the the racing bike and sprint up to the track without worrying about swapping wheels, bars etc. at the track (aside from pulling off the brake and flipping the rear wheel). I got a really good deal on this, umm, uniquely painted Marinoni which someone had built up and then decided that it wasn't for them. My standard mis-mash of components: Cinelli pista bar+stem, dura-ace track cranks, Suzue ProMax hubs, cheap-0 5 buck tank like seatpost etc. I haven't ridden it as much as I'd like due to work & weather issues (nothing worse than getting within sniffing distance of the velodrome and the heavens opening). The Cinelli pista stem is also a little tiring on a long track night but the bars are pretty great. 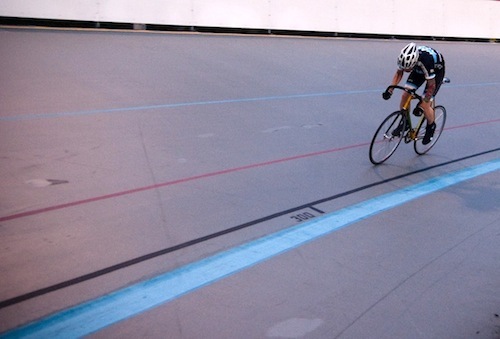 This bike is impatient to hit the new Chicago Velodrome. A one-off designed for my great messenger and racing careers (ha ha!). Hand made by Richie Ditta (the man, some say, brought fixed gear cycling to San Francisco) to my own crazy specs. The rear end is incredibly beefy, completely unique and totally weird. I love it!. 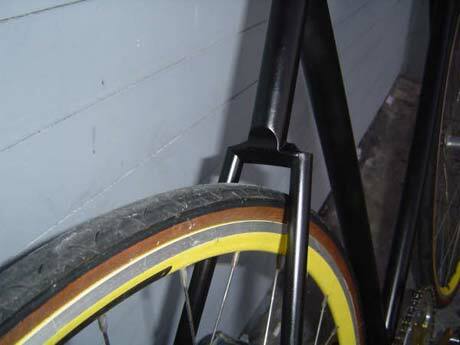 Theres more information on the frame here. 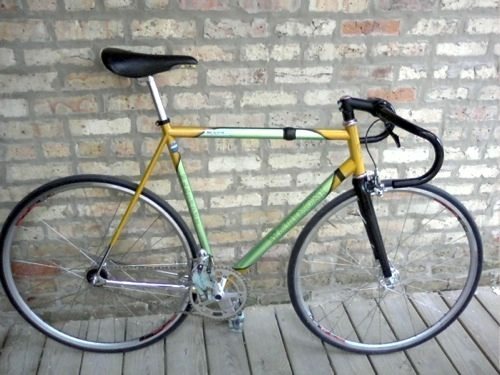 Yeah a real Eddy Merckx!!! What else is there to say?!?! The photo above shows the bike in its original form. 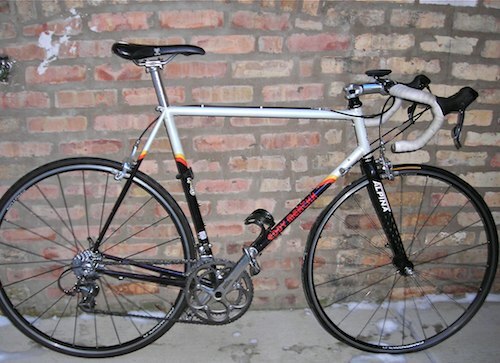 The paint job is a little questionable and the componentary it came with was a bunch of old tired Ultegra 8-speed (not the prettiest group every made ), however it fits great and on the downhills (i.e. overpasses when you're in Illinois) you can almost sense the presence of the 'Cannibal' himself urging you to floor it. 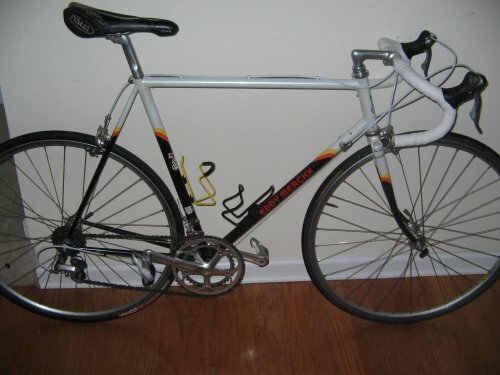 Its amazing what new gear will do to a classy steel frame (see photo below) and now it does double duty as my main training and criterium racing bike. Sweet! 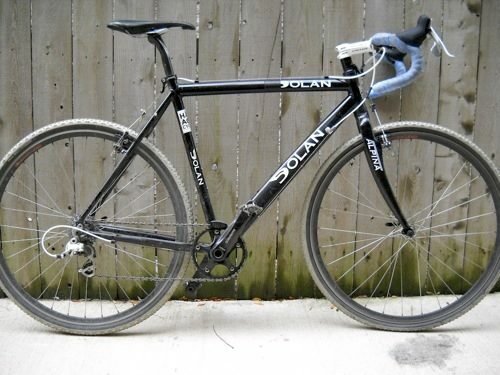 A Dolan multicross custom build. Actually this was my second cross bike in the first week of cyclocross racing, as I'm that tough (the Blue carbon frame I was using broke in the first race of the season). The frame was built up quickly and efficiently by Yojimbos so I could continue racing in the Chicago cross cup, this frame has proven to be awesomely capable. Raced to a number of top twenty finishes with its mis-match components and slightly odd style but once switching to a single-ring up front, the bike has really come into its own. There are very few negatives for this frame. Its little overweight, the cable routing is not cross specific so it routes under the bb, theres no flattening to the top tube for shouldering and theres a few too many Dolan logos on the bike. But for the money its been a great frame.